NSW has gone down the road of installing purpose-designed reef systems. It is possibly the best approach, but it is also the top-dollar approach. While NSW is doing a great job, I don’t agree with their departmental knocking of “junk” reefs. Junk reefs have been hugely successful. Steel boat hulls – eg scuttled trawlers, oil rig tenders – and unwanted concrete culverts and yacht hulls and the like – have been a great success around the world. In Australia, nowhere have junk reefs done better than in the NT. The NT has used scuttled hulls, mooring anchors, concrete culverts, bus stops, concrete pipes, and old mining gear. One of the best NT reefs is an old bottlewashing machine! History has shown that some types of junk are unsuitable for reefs, eg tyres. And some items – eg car bodies – don’t last long. Otherwise, junk reefs can be cheap and effective. The junk needs a clean-up, and then must be installed in a suitable area. It’s not that hard to do. In some cases NT reefs have been sunk by volunteers, working with government approvals, although the insurance implications are complex. Obsolete warships sunk around Australia for divers are, by definition, junk reefs. And they have worked well. I’d be keen to hear of any junk reef or shipwreck that has not worked well as a fish attracting device. 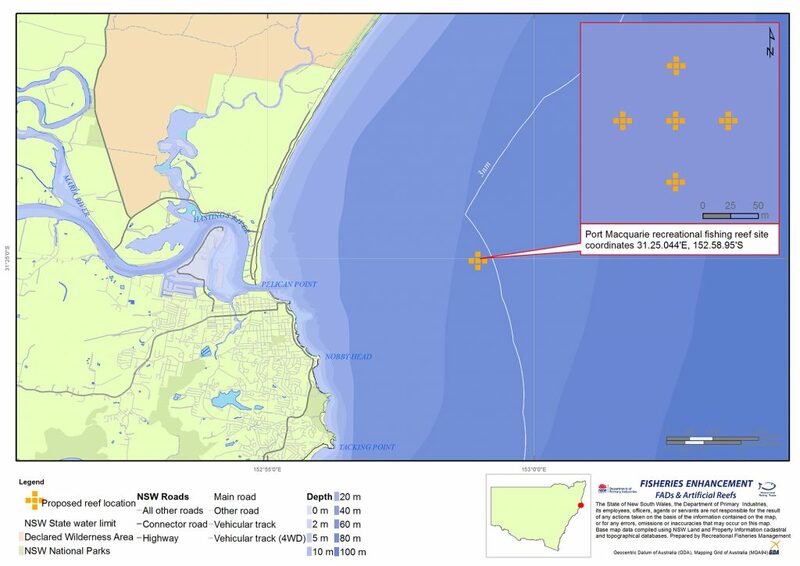 Meanwhile, here’s the link to the latest NSW artificial reef, off Port Macquarie. It was installed in February 2016, with 20 concrete modules each weighing 23 tonnes, each more than 5m tall. The modules were constructed in Newcastle and loaded onto a barge, which was towed to the artificial reef site. Each module was “expertly placed” on the ocean floor at a depth of approximately 46m, 6.3km off the coast. Great work boys. But no excuse to be knocking junk reefs!